A Mesh Pad is a knitted wire pad similar in appearance to steel wool. The mist laden gas stream passes through mesh pad and deposits mist particles on the wire surfaces. The mist particles coalesce into larger droplets which drop to the vessel bottom due to gravity. 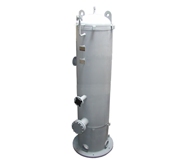 For applications with high viscous liquids, foams, or liquids or particulate that would clog a mesh pad, a vane separator is used. Vane separators are configured with a labyrinth form to force the gas stream to change direction a number of times as the gas passes through the vane pack. As the gas changes direction mist particles impact on the surface of the vanes. The vane edges are fitted with hooks to collect separated moisture and facilitate liquid drainage.